The down payment is also "reasonable," just $700,000. There is a lot of debate surrounding the decision whether to purchase or lease a new car. Buying seems like the better long term option, but people who like to switch cars often or can benefit from leasing. Leasing can give people the opportunity to drive a car that they couldn't afford through normal financing. A company called in Greenwich, Connecticut has just introduced a new lease for the Pagani Huayra, a car that can easily reach prices of over $3 million when optioned with expensive custom touches. Putnam is now offering a 60-month lease on the Huayra, which it claims is the most expensive lease in history. Buyers who want the privilege of driving the hand-built, 238 mph supercar will have to plunk down a deposit of $700,000. After the initial down payment, the Huayra will still cost $25,339 per month. That's essentially like buying a base Mazda Miata every month for 60 months. Though to be honest, we'd rather have a 764 horsepower V12 supercar than 60 Mazda Miatas and $700,000 in the bank. We aren't sure why someone who can afford to plunk down this much on the car wouldn't just purchase the car, but perhaps there is someone out there who doesn't want to pay out almost $3 million at once. 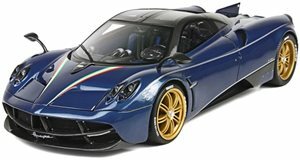 At the end of the 60-month term, the Huayra lease will end up costing over $2.2 million, which is around $500,000 less than the starting price of the car. We suppose saving half a million dollars is never a bad thing, but the person who buys the car will actually get to keep it in the end. Since we'll never have the chance to buy or lease a Huayra, we can just sit back and chuckle as members of the rich elite essentially buy a Mazda Miata per month to own a a rare supercar.